Proclear Multifocal lenses for presbyopia have a monthly replacement schedule and feature the patented Balanced Progressive technology to ensure sharp vision at all distances. 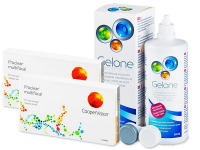 This economy package contains two boxes of three lenses each and a 360 ml bottle of Gelone Solution with an antibacterial lens case. Proclear Multifocal are monthly contact lenses manufactured by CooperVision, which are used to correct presbyopia. Presbyopia is a common eye defect and a natural consequence of aging that usually begins to affect people in their forties.